The sports celebrities aside of their talents are also popular about their body art passion. Their profession barely allows them to have a visible body art, but these athletes are determined to follow their passion for ink and body art and have a dozen tattoos on their body. From basketball players to professional wrestlers with a moderate to ultra heavy ink coverage, we are going to present you below the most popular sports celebrity tattoo designs. Enjoy! 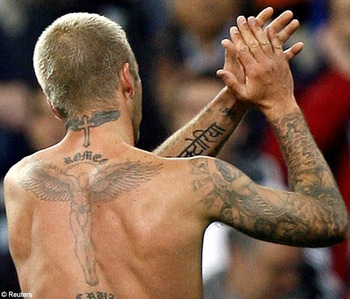 The famous English Soccer player is popular about many things such as his talent, passion about fashion, his beautiful wife Victoria and of course he is very famous for the ample number of tattoos.